Girl Scouts Rock! Tour Hits The Big Apple! Girl Scouts Rock! Tour is hitting the Big Apple this weekend! Roland Corporation U.S. and Girl Scouts of the USA have announced that the final stop in the brand new national Girl Scouts Rock! tour will take place in New York on Saturday, May 21, 2011. Girl Scouts Rock! is designed to provide girls with a hands-on experience playing popular music; an opportunity fewer girls are receiving due to school music budget cuts. Former Girl Scout and Disney star Shelby Spalione, previous lead singer of the all-girl teen rock band KSM, will also be on hand in New York to sing with the Rockin’ Roland Girls Band, talk to the girls, and inspire them to learn to make their own music and follow their dreams. Spalione, 17, who opened for the Jonas Brothers and Demi Lovato last year as lead singer of KSM, is currently working on a solo project. 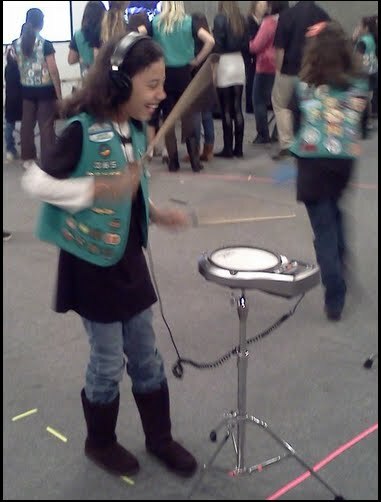 Girls will then be led into break-out sessions featuring activities utilizing Roland’s Lucina AX-09 Shoulder Synthesizer, HD-1 V-Drums® Lite, Rock Band 3, an interactive instrument display, and karaoke station. The curriculum is based on the latest Girl Scout leadership journey It’s Your Story –Tell It!, which uses a storytelling theme in fun and relevant ways to help girls understand themselves and their potential. Building a strong sense of self is an underlying goal of the series, which was made possible by a generous grant from Dove. Post-workshop tools will be available here! Do you have a favorite female rocker?